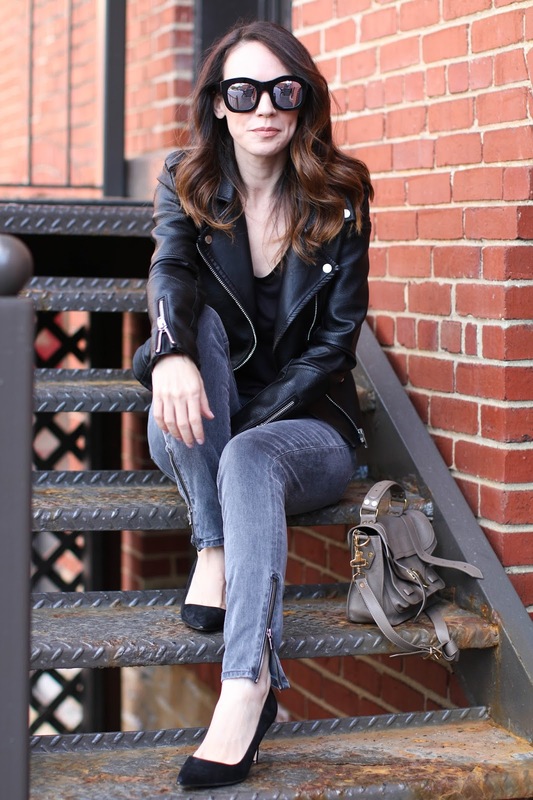 A moto jacket paired with skinny jeans - groundbreaking, right? Ha! This combination is definitely not the most unique one, but is always a no brainer. It's easy to put together and if I add a pair of pointy pumps - I instantly feel polished and chic. To be honest, I think pointy toe pumps could make a potato sack look chic. When I splurge on pumps, I like to get Manolo Blahniks because they are the most comfortable for me (I get the 70mm or 90mm), but I have found a few other less expensive brands that do an amazing pointy toe pump style. I live in these by Coach and since I have become a Sam Edelman fan after buying these boots - this style from Sam Edelman is one that I love. Temps climbed back up into the 80's today and yesterday so all of my fall pieces are on hold right now as I go back to summer dresses and t-shirts. I'm not anxious for winter, but I was just beginning to get used to sweater and light jacket weather. And my hair was falling into its no-humidity stride and living its best life as it does every fall. How rude of this weather to not consider our hair before switching things up. Thankfully my new curling iron is working wonders and is helping to smooth out some of that frizz for me. I gave a quick review in my latest video so be sure to check that out!